These stories are great! Highly recommended reading! Very Stout like flavor to the writing. I’d been looking for this site. Glad I found it again. I had it bookmarked and had a computer crash and lost the link. 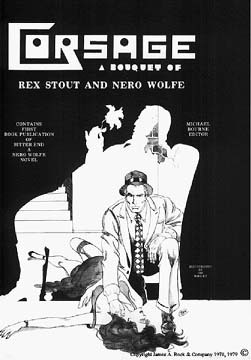 Above are scans of the front and back covers of a book about a young Nero Wolfe. Below is the text that I posted to the Wolfe List concerning this book. 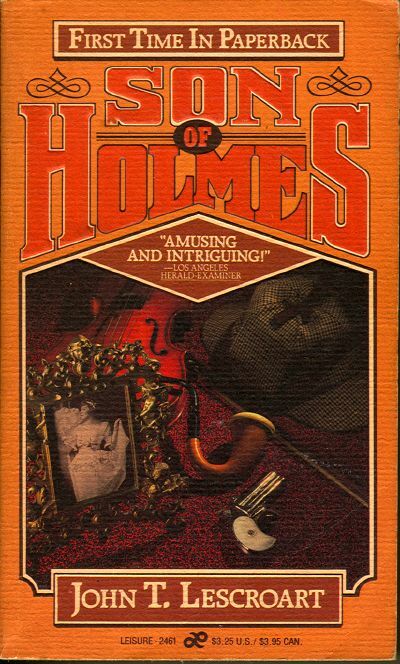 I have a book (paperback), Son of Holmes by John T. Lescroart copyright 1986, and am wondering if anyone here has read it. 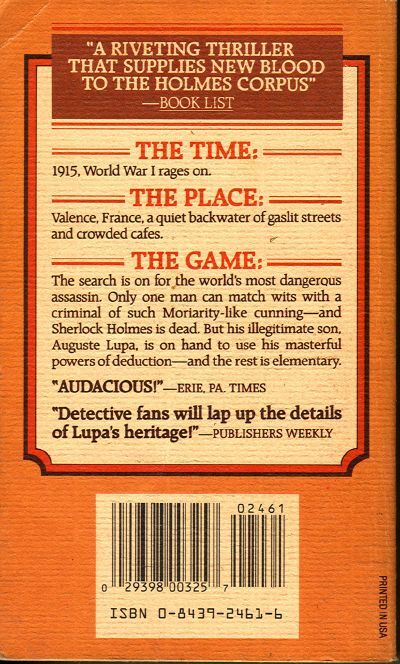 One of the main characters is known (no one seems to know his real name) as Auguste Lupa and is suspected of being the son of Irene Adler and Sherlock Holmes. Time of book is 1915 and the main setting is Valence France. In the opening of the book Lupa is described as: Having a high forehead and dark brown hair, combed straight back; the eyes not quite open and yet missing nothing; the heavy lips puckering after every swallow (of beer which he drinks from 9:30 to 12:00 in the morning every day). He was a big man and looked immensely strong, even dressed in an ill-fitting brown suit. His yellow shirt, which would have been garish, or-worse-memorable, on an assassin, was tight across his middle, but didn’t bulge at the waist. I haven’t read the book since reading and rereading the Wolfe series and while browsing my library today happened upon it and started reading. In the first chapter it is clear to me that this is a young Wolfe. The other character, Jules Giraud, has a personal Swiss chef by the name of Fritz Benet. Here is a tale to rival and put on the shelf with the best of Arthur Conan Doyle, an elegantly written whodunnit that features the deductive debut of Sherlock Holmes’ putative son. A man of large capacities and appetites, Auguste Lupa is never so happy as when he is seated at the dinner table, sampling the very best haute cuisine. Inevitably, though, trouble rears it’s impertinent head, and Lupa must throw off the role of bon vivant, even give up bon appetit, to assume the mantle of his legendary father.